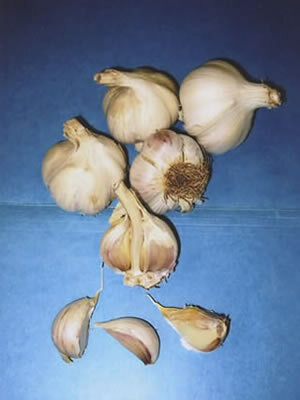 The garlic varieties we offer consist of both hardneck and softneck garlic. Hardneck garlics have a central stalk that goes from the base of the bulb straight up to the top of the plant and produces a flower stalk that is best removed to obtain larger bulb size. The cloves are uniform in size and cluster around the stalk and are easy to peel. There are hundreds of varieties of hardnecks with differing bulb colors, flavors, and growing characteristics. Some store for four months, some eight to ten months, but generally they don't store as well as the softnecks, also called artichoke or silverskins. Softneck garlics are considered a little easier to grow than hardnecks, especially in warmer climates. They have a flexible stem which makes them excellent for braiding. 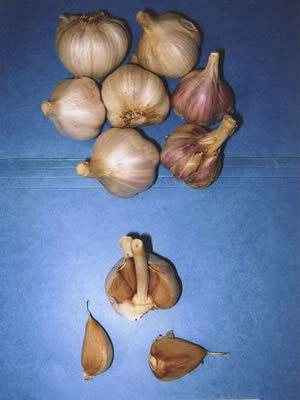 They usually have more cloves that are irregular in size and shape than hardnecks. With their many wrappers, they store well. Some will last a whole year before drying out. Softneck are generally mild and are excellent for baking.. They generally are harder to peel than hardnecks. A porcelain hardneck. Large, bright white bulb, 4-7 cloves the size of a Brazil nut. Easy to peel, stores 8-10 months. Hot if eaten raw, excellent flavor cooked. A porcelain hardneck. 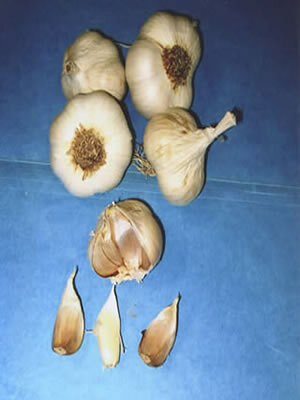 White bulbs with 4-6 large cloves. Stores 8-10 months. Very hot raw but cooking reduces the heat to a balanced garlicky flavor. 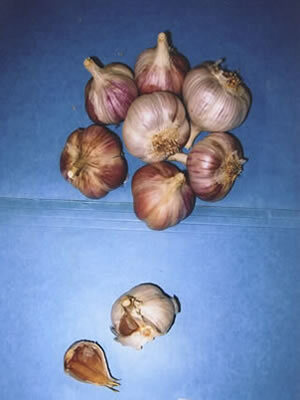 A marbled purple stripe hardneck with 5-7 large cloves that are easy to peel. Quite hot with excellent flavor.Originally from Germany. Stores 6-8 months. 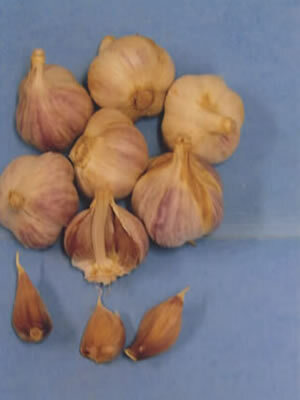 A hardneck purple stripe with 4-5 creamy-yellow cloves. Raw it has moderate heat. It retains a sweet pungent flavor when cooked and has an aroma of toasted hazelnuts.